The only match of importance on day 3 of the 2012 Olympic Qualifying Tournament is between Japan and Puerto Rico because the loser goes home. In Group D, France and Canada have not technically qualified yet but Mali's 66-point deficit against Canada makes qualification highly unlikely even if they beat France in the final match of the day. 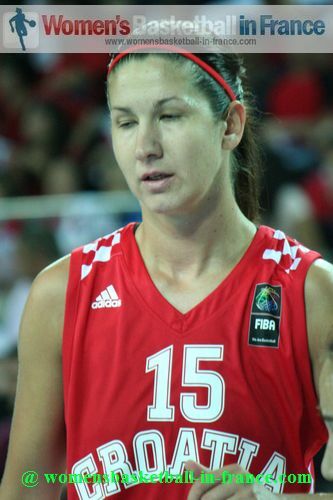 Marija Vrsaljko fired in 26 points for Croatia in their victory against Korea. This victory secured first place in Group C, while Korea have to be content with second place. Both teams had already qualified for the quarter-final of the Olympic Qualifying Tournament. 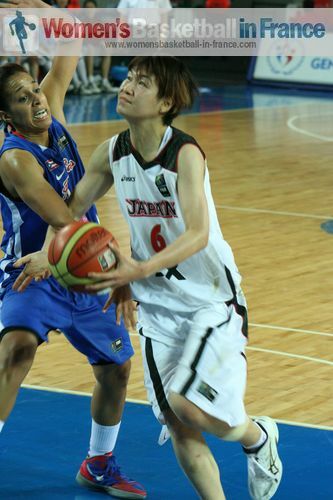 In the remaining games Yuka Mamiya's triple-double of 29 points, 13 rebounds and 14 drawn fouls (fouled on) helped Japan see off Puerto Rico (79-70), while the < strong> defeated Argentina (68-54). France ended the day by beating Mali (87-33). The winner from each game qualifies directly for the 2012 Olympic Games. The quarter-final losers will then play off for the last remaining place. You can move to any section by clicking on the links below or by scrolling down the page. Although France had not played their second match, both teams made the assumption that France would end up as Olympic Qualifying Tournament Group D winners. So to avoid a possible encounter with France it was important to win this game, hence it turned into a classic. Croatia got off to a flying start with a (6-2) lead within the first two minutes. But Korea hit back with a 7-0 run, concluded with a three-ball by Yeon Ha Beon (in picture) for her side to take the lead for the first time (9-6). The Croatian bench called for a time-out immediately although the game was not four minutes old. The lead changed four more times during the rest of the quarter with Korea coming out on top (19-16) thanks to their three-point shooting. 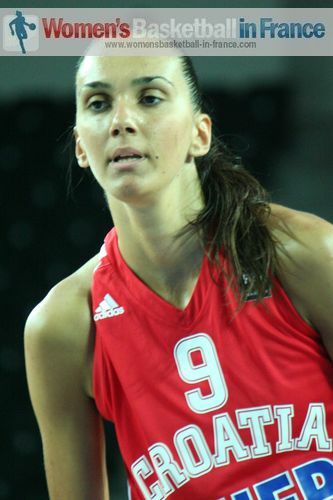 Croatia's captain Sandra Mandir who was scoreless during the first quarter opened her account to level the score for the third time (19-19). Croatia then recovered their running game with good mid-distance shooting to go 6 points clear (29-23) with 14 minutes on the game clock. 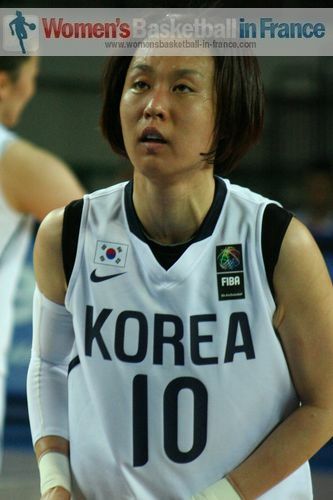 Korea had no option but to change their tactics and started to drive to the basket instead of going for outside shots. They had some success as they regained the advantage briefly (32-31) with three minutes left in the quarter. However the main problem for Korea with this tactic was that they left themselves open to fast breaks from their opponents. 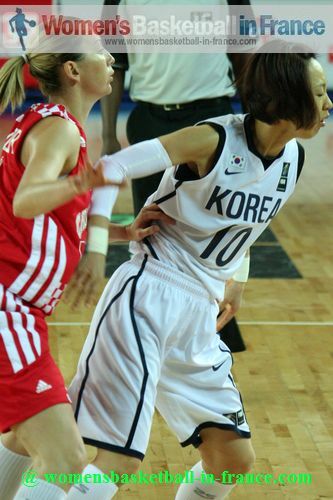 The result was Korea tired themselves out and Croatia finished with a 8-0 run to go into the locker room ahead (39-32). Croatia's advantage could have been more but Andja Jelavic was so exhausted that she missed the target completely with one of her free throws. After the break, the fireworks started as Korea went on the attack with success as they hit shot after shot. Croatia were on the back foot but thanks to Marija Vrsaljko (in picture) and Ana Lelas held on to the lead (44-40) with 24 minutes. A three-ball by Mandir put a stop to the Korean fight-back while giving her side a fresh breath of oxygen. Croatia pushed their advantage to 10 points at one stage but a three-pointer by Ha Beon reduced the advantage going into the final quarter (58-51). Korea went back to basics at the start of the final quarter with three-point shooting and fast breaks to tie the game (64-64) with just over five minutes to play. With the teams still locked together (66-66) Croatia switched to the three-point tactic and, under pressure, Jelena Ivezic and Mandir gave a master class in this art to give Croatia a 6-point cushion (72-66). However Korea were at fault defensively as both three-pointers came from the same angle. 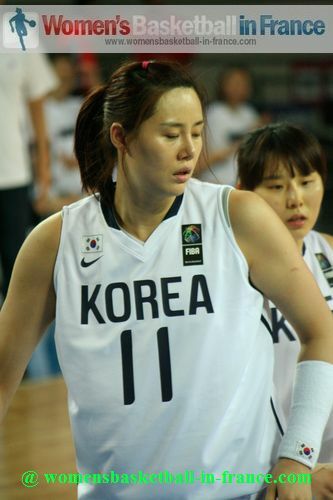 The Koreans were tired and with less than 90 seconds left to play they allowed Mandir an open three-pointer that more or less decided the game in favour of Croatia (77-70). Korea had to foul for the remaining time to stop the clock but Croatia hit all the free throws to win the match (83-75). 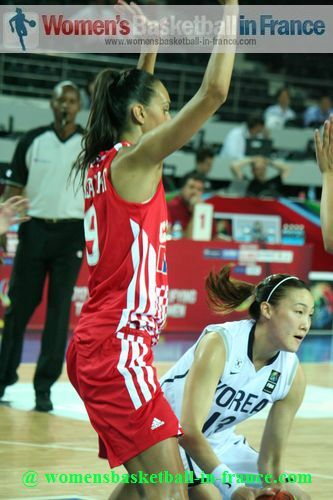 Maki Takada was fouled twice and went 3-of-4 from the foul line to give Japan an early lead. For Marie Placido from Puerto Rico with 2 fouls it meant time on the bench. Despite the efforts of Esmary Vargas, Puerto Rico were too passive and trailed (4-12) with less than four minutes played. Despite Placido's foul problems she was brought back into the game and her presence on the court calmed her team-mates who then went on a 5-2 run (9-14). 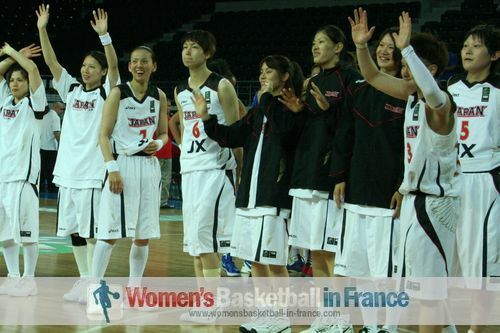 However Japan finished the first quarter with a flourish to briefly lead by 10 points before ending with a (19-11) lead. Puerto Rico were much better in the second quarter and led by their captain Jazmine Sepulveda reduced their deficit to 3 points (20-23) five minutes into the quarter. The rest of the quarter was entertaining as both teams just ran up and down the court and shot at will with no obvious systems. The advantage for Japan (30-28) was mainly due to the 12 points of Yuka Mamiya (in picture). Both teams came out ready to play basketball after the break. 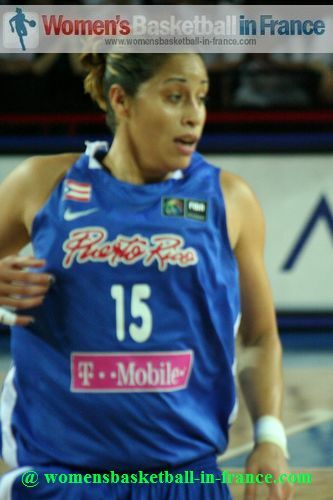 Carla Cortijo from Puerto Rico tied the game for the first time (30-30) in the game. The rest of the quarter was an offensive festival with the lead changing hands as the veterans took over. 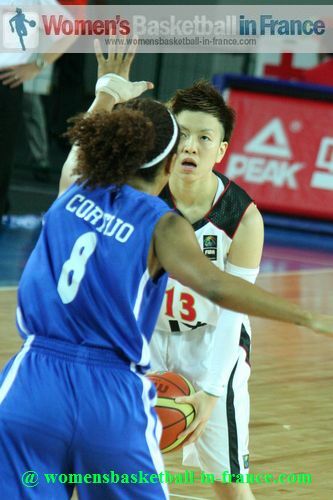 Yuko Oga's 11 quarter points enabled Japan to finally gain the upper hand going into the final quarter (52-43). The final quarter was basically a shoot-out with Japan never in danger of losing their hold on the game. 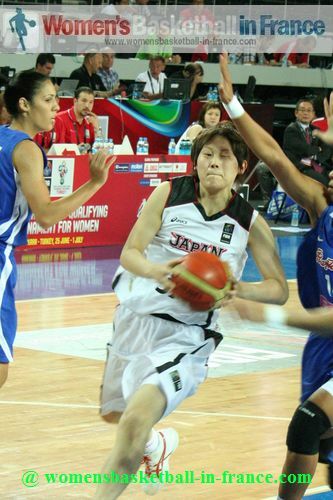 Yuka Mamiya was unstoppable and finished with a game high of 29 points and 15 rebounds. She also drew 14 fouls to complete her triple-double. 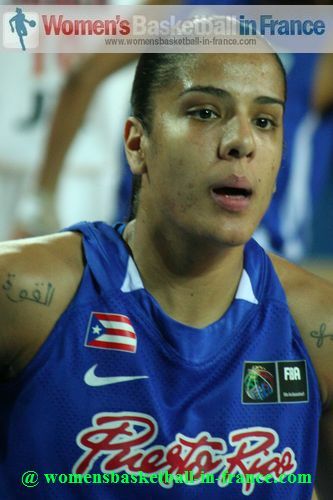 For Sepulveda who scored 24 points, her Olympic Qualifying Tournament is over. The Czech Republic appeared to be on their way to an easy victory with an 11-0 run to lead (13-2) after six minutes. Argentina appeared a little lost on the court but somehow scored 9 points during the first quarter as the Czech Republic relaxed. Leading (19-9) at the end of the first quarter the Czech Republic went to sleep while Argentina stepped up. All the same the Czech Republic came back to live with an incredible off-balance shot by Katerina Elhotova (in picture with ball) which was the main highlight of the quarter at the final second. 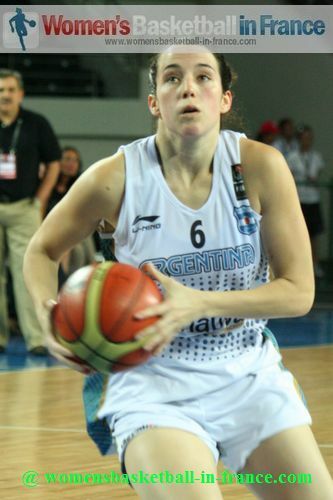 Argentina had an inbound just under their basket which Paula Reggiardo managed to convert to the annoyance of Lubor Blažek, the coach of the Czech Republic. He left for the locker room fuming despite leading (30-22). After the break the Czech Republic were more lively and with back to back three-pointers by Elhotova started and 2 points by Alena Hanusová started to run away with the game (41-24) midway through the third quarter. 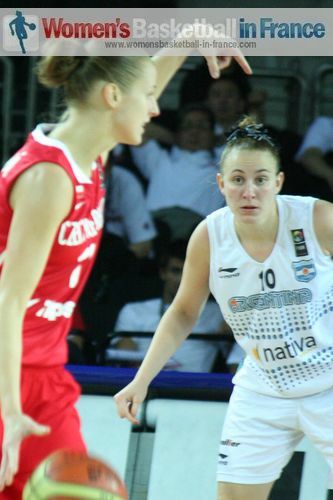 The Czech Republic then controlled the pace of the game for the last 15 minutes and won comfortably (68-54). In the 2012 FIBA Olympic Qualifying Tournament quarter-final the Czech Republic will face Japan while Turkey meet Argentina. France scored the first 7 points of the game and looked comfortable in front (14-6) after five minutes. 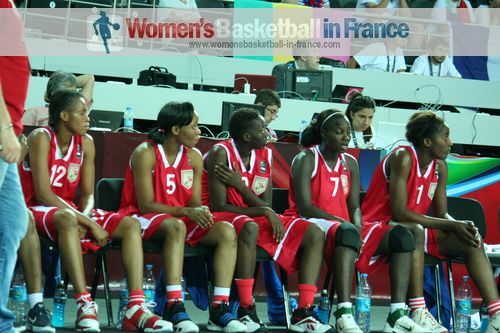 However the remaining five minutes proved to be difficult for France because Mali played hard defensively. All the same France led (18-10) by the end of the first quarter. 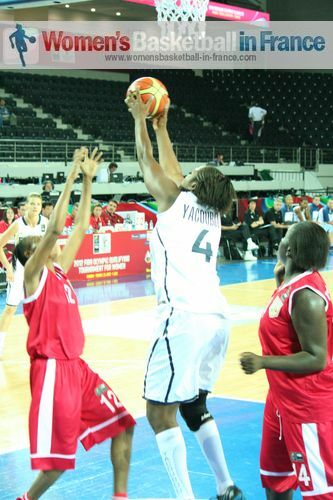 Any time Isabelle Yacoubou-Dehoui got the ball in the paint she was swamped by at least three players which appeared to affect her free throwing. France accelerated slightly during the second quarter to extend their advantage (30-14) to 16 points midway through the quarter. Mali continued to swamp the paint when any French player had the ball and managed to slow France down. However Mali were not able to finish any of their scoring opportunities and went into the locker room trailing (17-43). In the second half, the youth players on the Mali roster battled away bravely and kept their heads up despite having no chance of winning the game. France won the game (87-33) and will take on Korea while for Mali the Olympic Qualifying Tournament has come to an end.